Find something for everyone on your list with these unique Grommets. We've rounded out the week with best games and toys for the little ones on your list. Oliso Iron. We have friends who love to iron, and friends who don’t. No matter which camp you fall into, Ehsan Alipour has created an iron that will make short work of the pile of grandma’s linen napkins waiting to grace your holiday table. 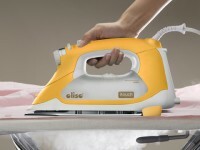 Buy the Oliso steam iron here. KaZAM Balance Bicycles. Pedal-free balance bikes aren't new, but KaZAM bikes boast several features that beat the competition, hands (or should we say feet?) down. For starters, KaZAM founders Michael and Elizabeth Wagner and John and Mary Beth Lugo sought input from the cycling community to ensure their balance bike is engineered like a real bike, not a toy. 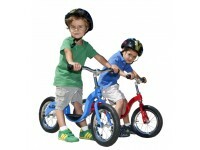 Buy the KaZAM balance bicycle here. Utilikilts. Far from tartan, Utilikilts are made from 8.5 oz cotton-poly twill that will wear long and hard. (Choose from black and digital camo.) The neo-traditional, overlapping apron design offers ample coverage in front. And its trademark six snaps and two free-hanging saddle cargo pockets make it work. Once you commit to the revolution, you may never go back. Here's Nathan Salmon sporting a Utilikilt. Joanne had to get her picture taken with him. Buy Utilikilts utility work kilts for men here. This week we featured Brooklyn Brew Shop's beer making kit. With its compact size and microbrew mixes that change seasonally, making beer at home could be your new favorite pastime. Bring home th pub with this Grommet. Buy Brooklyn Brew Shops beer making kits here. If you are looking for a gift that will capture the imagination, this Grommet toy roundup is for you. We've selected the most unique toys and games perfect for the little ones on your holiday lists. Buy Brooklyn Brew Shops beer making kits here.